Hiv Basic Care Still A Viable And Affordable Care And Support Intervention – Integrated Community Based Initiatives (ICOBI). Jussy Mujuni a 37 year old widow of Bwegiragye cell, Ward IV, Bushenyi Ishaka Town Council .has four children and a person living with HIV. She tested for HIV in 1992 having had frequent illnesses and at the same time her husband had developed Herpes Zoster. The husband had tested for HIV but had not disclosed to her and more to that Jussy was pregnant. 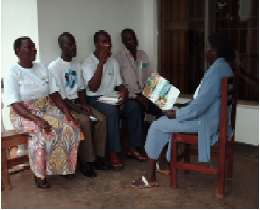 Having got information about HIV/AIDS counseling and testing and also reflecting on her health conditions including her husband’s poor health, she decided to take an HIV test. Amidst minimal health care and support services by that time, She lost hope and I knew it was the end of every thing. After a few months her husband died and later her 12 year daughter. This further troubled her as she narrates “who ever saw me at that time would not image that I could live longer than a month”.